As “Creed” (2015) opens, the young Adonis Johnson, son of the legendary boxer Apollo Creed by way of an extramarital affair, is in a youth detention center. A fight breaks out, affording him the opportunity to foreshadow his future boxing skills, the ones inherently passed down from his father, though the sequence, given its setting and the subsequent scene, when Apollo’s widow Mary Ann (Phylicia Rashad) arrives to take Adonis in, evoke something further – the lack of and the need for a community. That is why even the flash ahead to present day, where adult Adonis (Michael B. Jordan) toils away at a white collar job in the immediate aftermath of taking fights in Mexico feels less like an obvious representation of the thrill being gone than a swift evocation of how The Boardley Financial Group (ick) isn’t the community Adonis is looking for. No, the community he’s looking for is in Philadelphia, which is where he goes after resigning from The Boardley Financial Group (ick). He finds his community with Rocky Balboa (Sylvester Stallone), sure, his pops’s old friend and foe, who Adonis wants to train him, and who will, as he must, eventually come around, from love rather than obligtation. And Adonis finds it in Bianca (Tessa Thompson), The Woman Downstairs, less Adrian than Rihanna, an aspiring hip-hop artist with hearing loss, hashed out in a mini-monologue where Thompson truly goes for the Iggles accent, explaining it’s all about doing what you love for as long as you can, a truth that cuts straight to the heart of “Creed” even as her plight makes you want to stop the movie and listen to Side A of “Run-D.M.C” one last time because, damn man, your hearing might just go one day too and you might have missed your shot. She explains this foible in a scene over cheesesteaks, set at Max’s, a little real life flavor that Coogler smartly injects throughout, particularly later during the training montage which becomes more than merely obligatory with neighborhood motorbikes accompanying Adonis on his run through city streets. 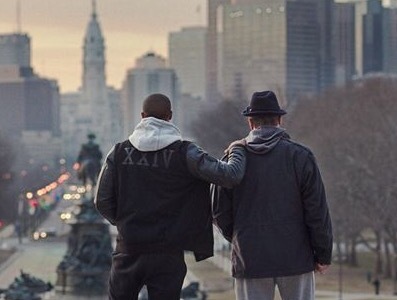 The first time I watched “Creed”, I yearned just as much for a movie called “Bianca”, though watching “Creed” again made me yearn for a movie, any movie, where it’s just Jordan and Thompson, so crackling and natural is their chemistry. Verbally, dynamically, charismatically, they go toe to toe like Adonis and Pretty Boy Ricky Conlan (Anthony Bellew) go toe to toe in the climactic fight, more peacefully though, mostly, never to more stunning effect than when Adonis tries to decide, upon orders by Conlan’s people as a condition for finalizing their epic bout, whether to take the surname Creed. 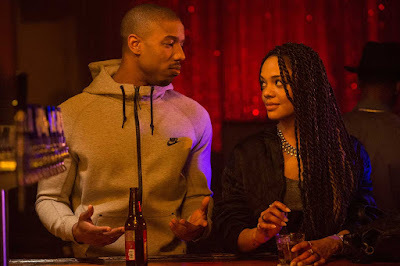 Coogler frames this scene so that Adonis and Bianca are in bed but sitting up, him braiding her hair, deliberately feminizing an otherwise masculine pugilist, like he’s meeting her in the middle, and which she also does with him throughout. He’s in her corner, and she’s in his, and when he expresses doubt about taking his dad’s name, her telling him what he needs to know with repetition of the word “right” is like the cadence of a coach to a boxer between rounds. It’s an incredibility intimate, deep scene, bridging their worlds and genders, signifying how he is emotionally letting her all the way in. The fight is the film’s climax, of course, just as it was in every “Rocky” movie before it, including the original, which Adonis vs. Conlan quotes from liberally, not just in Bill Conti’s famed music cue at a dramatic moment, but in how Adonis seems to gain strength by not putting up his hands – even as you keep hearing the corner cry out for him to do so – and taking constant punches to the face, classic Balboa, man. It’s all thrilling stuff. But like the rest of the movie, Coogler adds crucial texture to this fight by giving Rocky Balboa his own fight outside in the ring in the form of cancer. If that sounds maudlin, it does not come off that way because of how Stallone has Rocky meet the diagnosis with a small, sad smile, as if humored by the cyclical nature of the universe. His verbal explanation is mostly superfluous, just the character’s penchant for babbling, as the split-second in which Stallone softly holds his porkpie hat to his chest communicates everything, a man who is watching his life flash before his eyes. He tries to keep it secret, but Adonis makes him spill it and convinces (forces) his mentor to face the disease head on. And if Rocky is introduced alone, running an Italian restaurant no one seems to visit, chatting to the spirit of his wife in the graveyard, he finds a sense of community too. The original “Rocky” ended ringside, but “Creed” goes one scene further, returning to the steps of the Philadelphia Art Museum where so many mornings ago a younger Rocky first ascended in side-clenching pain and then later took several steps at a time as if he had wings on his feet. Now, older, feebler, he needs help to ascend, which Adonis is there to give. If that’s all it was, the scene would be incredibly moving. But these steps, of course, are as famous in pop culture, like the Rocky statue itself, which is glimpsed earlier in the movie when Adonis visits, using a real thing based on a movie in a movie based on the movie that brought about the real thing, blurring the lines between fantasy and reality, inviting us all in to the share the moment, connective tissue to the franchise’s considerable history, a sense of belonging for characters and viewers alike. Love it ... thanks for this Nick. And: Hey! How are you? DEREK AND/OR VANCE!!!!!! Lovely to hear from you! Good, my friend, good. But, busy. So busy these days. Can't stop in at The Audient, or anywhere else for that matter, like I used to. Even so, I will be there for your year-end list, which I'm always excited to check out. How are you?